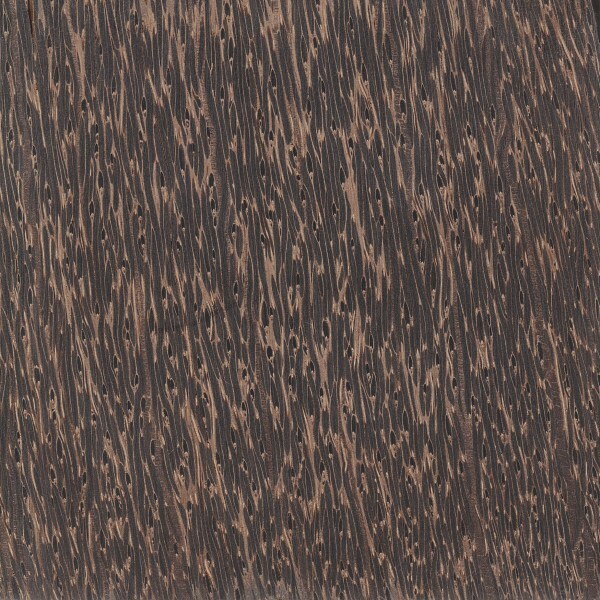 Grain/Texture: Black Palm has a medium to fine texture, though it is by no means even or uniform on account of the contrast between the dense, darker fibers, and the soft, lighter cellulose structure of the wood. Grain is very straight, and contains no growth rings, knots, or defects. Endgrain: Being a monocot, endgrain characteristics are non-typical when compared to more familiar hardwood dicots. 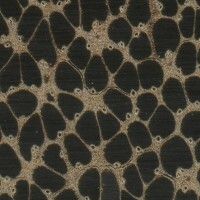 Black Palm has a uniform distribution of black fibers embedded in a softer yellow/brown body of parenchyma. Growth rings, sapwood, and rays are completely absent. Endgrain exhibits a dotted pattern unique to palm trees. Rot Resistance: Black Palm is reported to be durable regarding decay resistance, though it is susceptible to insect attacks. 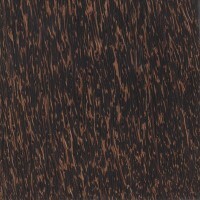 Pricing/Availability: Although Black Palm trees can get up to several feet across, the center of the trunk is filled with a soft, unfigured portion, with only the outer areas of the trunk containing the characteristic colored fibers, so only narrow boards and spindle-stock are normally available. 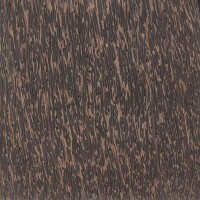 Prices for most sizes of Black Palm should be in the moderate range for an imported tropical wood. Common Uses: Flooring, boatbuilding, walking sticks, knife and tool handles, rafters, furniture, and turned objects. Comments: Technically neither a softwood nor a hardwood, palm falls into the category of monocots, which also includes bamboo, grass, banana, rice, wheat, corn, etc. (Monocot is short for monocotyledon, which simply means that the seed of the plant contains one leaf, rather than two as found in dicots.) Palm woods have no growth rings, and as a result, the shrinkage rate for drying the wood is more or less uniform between the radial and tangential surfaces, resulting in a T/R ratio of 1.0 and good dimensional stability. 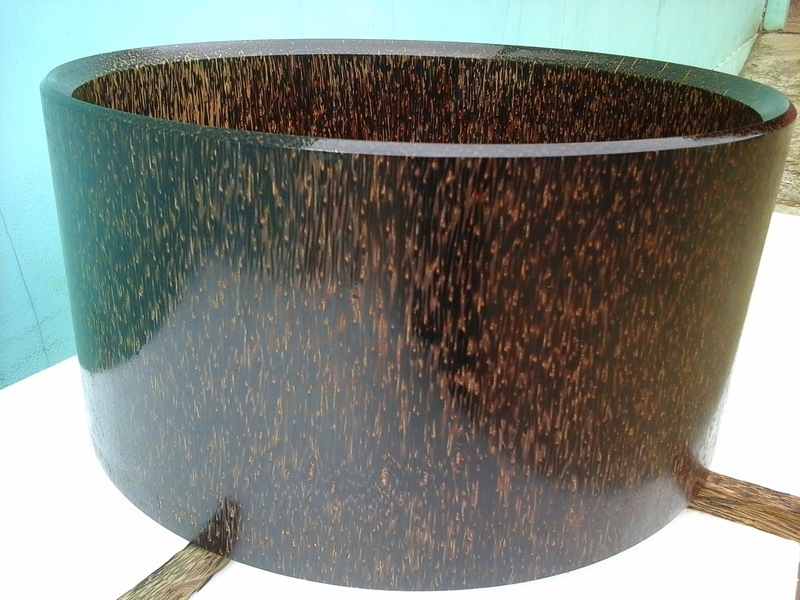 Black Palm is highly variable in weight, strength, and hardness properties because the wood is so non-homogenous: the trunk is a gradient between the strong fibrovascular bundles, and the softer cellulose structure. Toward the outer wall of the trunk, the density of the wood is the greatest, and gradually becomes lighter, softer, and weaker towards the soft core. Because of this great variability, the density of Black Palm can range from less than 25 lbs/ft3 (400 kg/m3), to over 62 lbs/ft3 (1000 kg/m3)—where it will actually sink in water. A quick visual inspection of prospective wood blanks can help screen out undesired pieces: darker wood usually has a denser packing of fibers, and tends to produce heavier, stronger, and harder material. 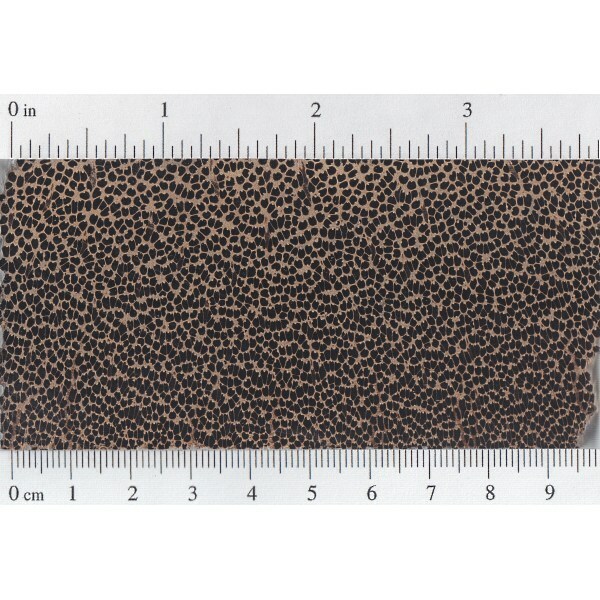 Scans/Pictures: Pictured below is an example of a rather dense and tightly packed specimen whose weight was approximately 68 lbs/ft3 (1090 kg/m3). 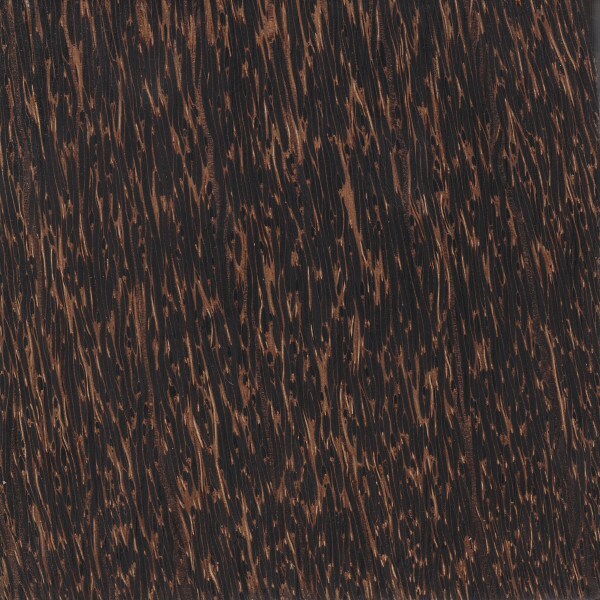 I recently bought a piece of Palm Black and want to use it as a veneer on the head stock of an acoustic guitar I am building. Does anyone see any problem with that application? I’ve not used black Palm myself but watching it be worked it appears quite splintery and likely to break when being cut into a thin veneer. 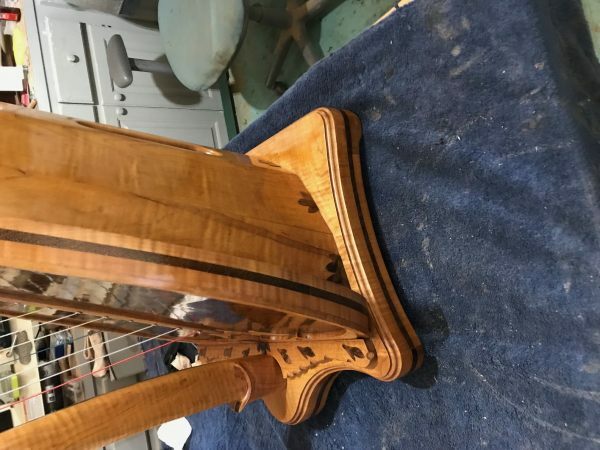 Here’s a harp with black palm sandwiched between caramelized curly maple. I use it for strength (1,870 pounds of tension on the strings) in the pillar and neck and below the soundboard. The dark stuff on the soundboard is burl walnut so don’t confuse it with the palm. Go to vavraharp.com for more pics. So is this a solid trunk that you’ve hollowed out? Seems like that would be the perfect use for palm, since the center is much softer anyway, and the best material is out on the edges of the trunk. Does anyone out there know what, if any fruit Black Palm produces? Coconut Palm (Coco in Philippines) is more of a tan – light brown, is this just a variation of “Black” Palm or is it independent bearing different fruit? Thank you for your reply. I am making a set of wood pens for a friend who is big into cooking and healthy foods. We decided to go with food related woods for the project. I just happen to have Black, Red, and apparently another shade of “Red” (Coco) on hand. I went thru Jungle Operations School in Panama. All I or anyone else who has been thru it will say about Black Palms is they hurt like all get out if you walk into one at night or if you sit down without looking. Panama is the only place I’ve ever been where the plants wanted me gone. The Trees have these long unfriendly spikes/barbs that I was told are good for blow-gun ammo and nothing else. No way anyone is shimmieying up one to grab fruit. Wikipedia claims “The fruit is edible for humans, as are the palm hearts.” All I can say is “Good Luck getting it”. From my experience, you are describing the peach-palm (pejibaya), https://en.wikipedia.org/wiki/Bactris_gasipaes. The black palm is native to Asia. I’m brand new to turning (this is my third bowl) and was wondering what type of finish is recommended. Currently it is just sanded up to 600 grit. If it isn’t sealed is it more likely to crack? Depends on the look that you’re going for. If you want a more natural, low-sheen look, you could use something like boiled linseed oil. Just keep in mind that the oil will tend to darken it more than other finishes, so you may lose some of the contrast between the light and dark areas. Otherwise, you could seal it (preferably with shellac), and then top coat it with something glossy like poly or lacquer. Generally, the cracking (checking) occurs as the wood initially dries. After the wood is dry, turnings don’t tend to check any further (regardless of finish). 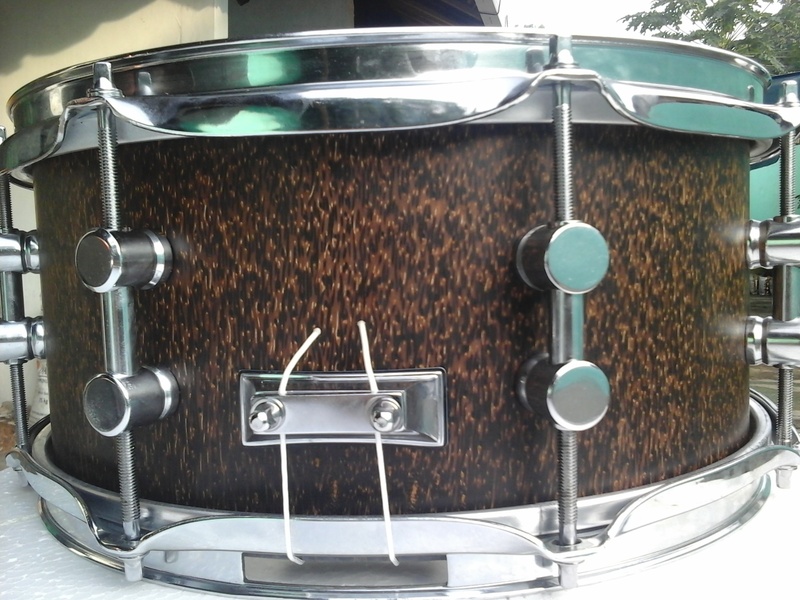 To turn black palm, use CA glue. Put a light coating on and let dry. Turn until you no longer hear the loud cutting sound. Then, apply another coat, etc. etc. Until you have your finished piece. A lot of work, but can make a nice gift when finished. I’ve done a blush brush out of black palm and have done a carving knife and fork set. I won’t lie. I have had a number of very long splinters in my hands when I was working the wood for the knife and fork. Keep a good pair of tweezers handy and make sure no children are around…due to the cussing. I interned at a carpenter shop in Peru for about a year and they have a wood called Pona that looks very very similar to this.I think the scientific name is Iriartea deltoidea. 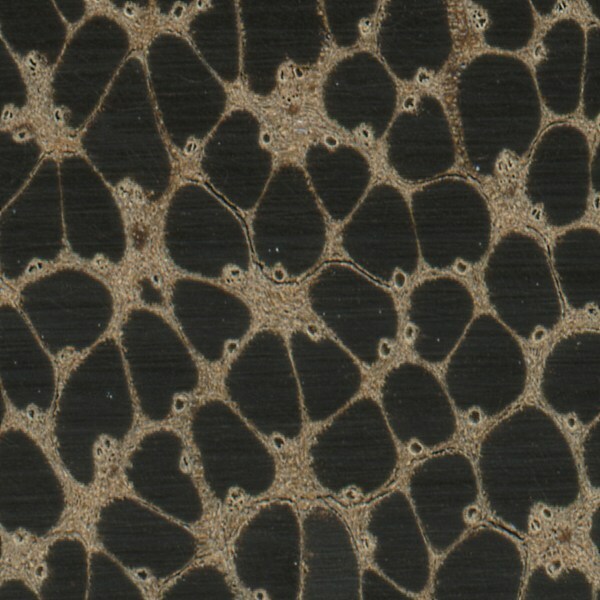 I plan on sending a sample to the Center for Wood Anatomy to find out exactly what it is. Would y’all be interested in a sample? If so, would you do all the tests and everything on it? I’m very curious. The way I understand it, most palm “wood” can be categorized into red or black groups, and it looks like yours is a black palm. Even though I list only one species at the top of this page, black palm can be a number of different species in the Arecaceae family. In all honesty, I probably wouldn’t need a sample, as they all seem to be close to the same stuff anyway. I don’t do much in the way of testing, beyond just weighing the wood, and then estimating the Janka hardness if there’s no known published value. Alright, well thanks for the reply! Black palm is called Tal here . It is treated as the strongest wood in India . It is specially used as beam , cart shaft , staff , walking stick , spear shaft , axe handles etc where strength , elasticity and durability are prime concern . In rural India black palm beam goes for generation . It is said : where black palm fails , only solid steel should work . I have a black palm staff ( 5 ft long , 1.25 inch diameter )made by a tribal carpenter and its just black without any sapwood . I often use it to break coconut , other wood sticks etc with one blow ! But it is really difficult to work with . A nicely polished , min 1.25 inch diameter staff made of only heart wood is nothing but a great weapon ( that is rarely breakable – I’ve never heard to break !!! ) . So the people say : Keep black palm away from water and fire , it will stay forever . I first ran into black palm when I was in the Army in Panama in 1966. It was coverd in fine porcupine like quills. If you were out in the jungle at night you new you were going to be pulling the ends of the quills out of your palms and various other unmentionalble parts of your body for the next month. I’ve used Black Palm to make some picture frames. 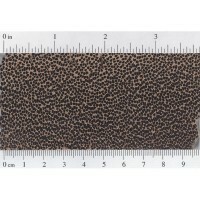 It is tricky to work with due to its fibrous nature and it is very difficult to get a smooth surface on it. I can’t imagine successfully turning it. It is absolutely ‘unwilling’ to be cut into the grain. Overall I was pleased with the result, but I probably would not use Palm except for very specialized applications. This frame was for my parent’s anniversary and palm trees have a special meaning in their lives. I did discover, while making my frames, that the wood has a very ‘interesting’ appearance when cut on a diagonal to its grain (looking at the inside of the miters). The dark strands, which are normally long on the face/edge grain and merely dots on the end grain, had a nice oval appearance on the diagonal. I think I’ll be using these as decorations on other projects. I have had zero luck turning black palm. I bought a turning blank for a bowl. It came apart badly. I tried to salvage a couple of of the pieces as pen blaks with the same results. Maybe it was a bad piece of wood, or my tools weren’t sharp enough, but I’ve shied away from it ever since. I have a board that must be a freak of nature. It has every appearance of black palm in grain and color but is over an inch thick and eleven inches wide by about eight feet long. Is this even possible or is there a wood out there that resembles black palm that closely? This board was procured over thirty years ago, maybe they grew them bigger back then? The person who gave me the board said it was cocobolo.